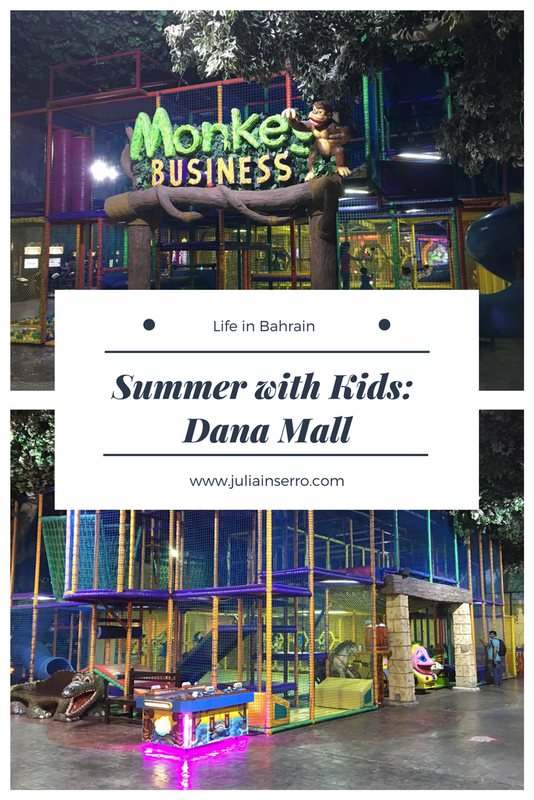 I almost hate to admit this out loud, but Dana Mall has become one of my favorite go-to spots for these sweltering afternoons. The reason? It has a large play area that includes the trampolines and unlimited time for just 2BHD and during the week it's practically empty. I can't find much information about the mall itself, except that it's one of Bahrain's first, so it's older and smaller than most others. But in addition to the play area, which I will describe next, it has cinemas, a few shops, bowling lanes (2BHD per person per game), pool tables and a LuLu Hypermarket. It also has nice wide parking spaces. I know that the painted parking lines are mere suggestions to many people, but in some of the malls they are so narrow that if you actually adhere to them, no one will ever be able to open their doors. But at Dana they are nice and wide and accommodating for doors that actually open. Small things matter. The play area is called Chakazoolu, and like all the others they require a card to play the games or ride the rides. All of the malls seem to offer a bonus when you put 5 or 10BHD on the card, they'll add 1-3BHD extra. Depending how often you come it's definitely worth it. The play area has two levels and lots of little rides (cars, merry-go-rounds, etc.) and video games. They also have bumper cars, a little train (500 fils), bumper boats, mini bowling lanes, miscellaneous carnival-like rides and even a roller coaster that whips around, under and over you. 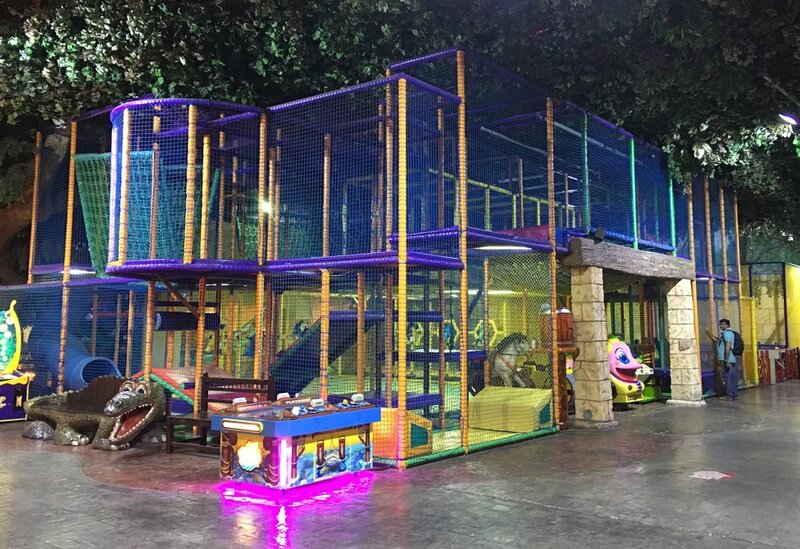 The enclosed jungle gym area includes two big slides, multiple levels, rope bridges and all sorts of climbing opportunities as well as two large trampolines. And for just 2BHD kids can come and go all day. In addition to the tire-them-out factor, the added bonus of these jungle gym areas is that you can watch parents in all manner of dress clambering through, up and over the various obstacles with their kids. I watched a dad the other day in a pristine white dishdasha (typically worn by Arab men in the Gulf region) dutifully following his three-year-old daughter through the maze. They both were obviously having a lot of fun. And as a parent who has clambered over and around it myself, I can add that it can be a nice little workout for some of those lesser-used muscle groups. As a rule, if you're looking for hospital-like sterility, I would suggest you avoid any and everything where children are. But for the most part, these mall areas are relatively clean. I also like to think of them as little immunity-booster outings. Chakazoolu does not require socks, but they do ask you remove your shoes in the jungle gym area. But after a few visits I have learned that socks are far easier to clean off than blackened feet, so we shall be keeping a well-stocked sock box in the car.